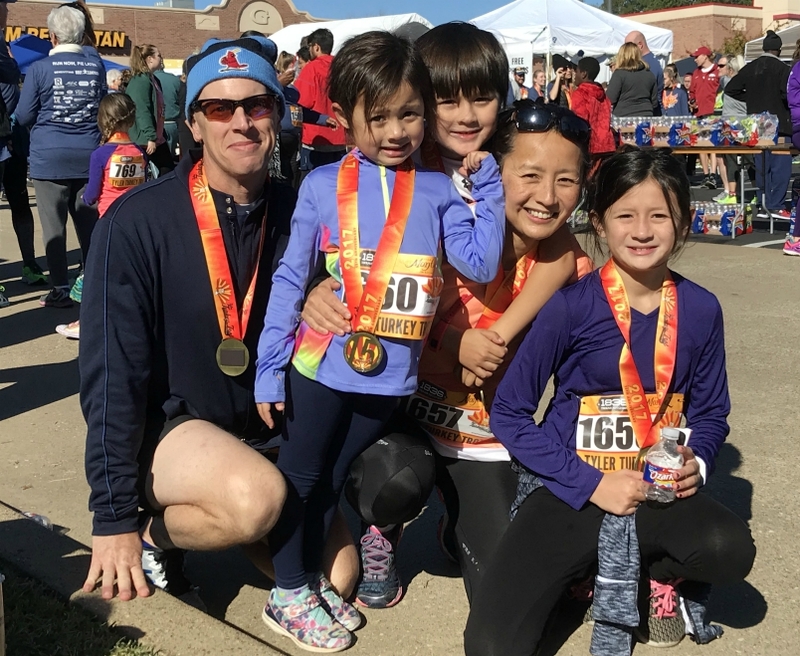 From left: Derek, Julia, Zachary, Li-Yu and Sophia Mitchell at the 2017 Turkey Trot in Tyler, Texas. Photo courtesy of Li-Yu Mitchell. At first, all Dr. Li-Yu Mitchell wanted was for some of her patients to walk more. So she began meeting them at a park on Tuesday evenings for a 2-mile stroll. A few years later, she found it strange that her city’s fitness campaign lacked a walking program. So she started one. Her kids grew up attending her walking events. They’ve also been at races she and her husband have run – first at the finish line, and once they grew old enough, joining their parents as participants. So perhaps it was inevitable that she started a run-walk program at their elementary school. Starting – and sustaining – these programs has been challenging, especially for someone who never saw herself as a community organizer. Yet what drives Li-Yu (pronounced Lee-Ee) is a joy similar to healing a sick patient. She’s seen a reluctant walker become a half-marathoner. 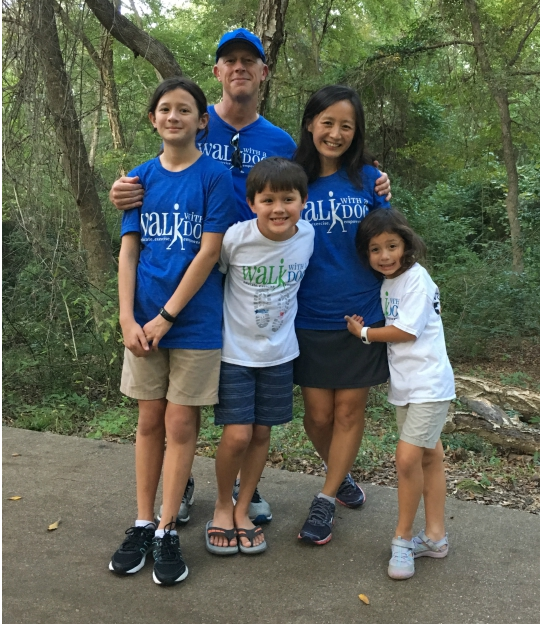 She’s marveled at a cancer patient showing up on days she received chemotherapy – “and she was one of our fastest walkers.” In February, Li-Yu pushed back a family ski vacation because the kids didn’t want to miss checking in for their run-walk program. Clearly, these groups are more than the sum of their parts. They can be something special. Wednesday is National Walking Day. If you’re already a walker or runner, you may already know the power of exercising with others. If not, this occasion could spur you into action. 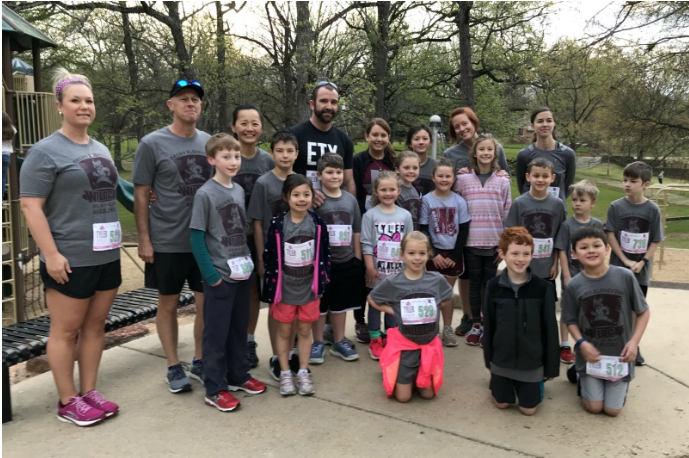 Members of the Brown Elementary School walk-run club participated in the Tyler Azalea 5K and 10K on March 23. Photo courtesy of Li-Yu Mitchell. Raised in Angleton, a town on the outskirts of Houston, Li-Yu began running as a teenager. It remained her solace through college and medical school. She married a fellow doctor and they started their careers in the East Texas city of Tyler. She set up a family medicine practice in 2002. She became close with many patients, learning not only what hurt but also what made them happy. The treasured interactions took time, making her less efficient but more connected. By 2006, she was tired of hearing folks vow to start exercising and not do it. A recurring theme was that they didn’t have anyone to join them. So she invited about 15 patients to meet her one Tuesday evening at a park. The meetings became weekly. Turnout ranged between five and 15. Keeping the commitment was tough. Once her twins arrived in 2008, it was impossible. 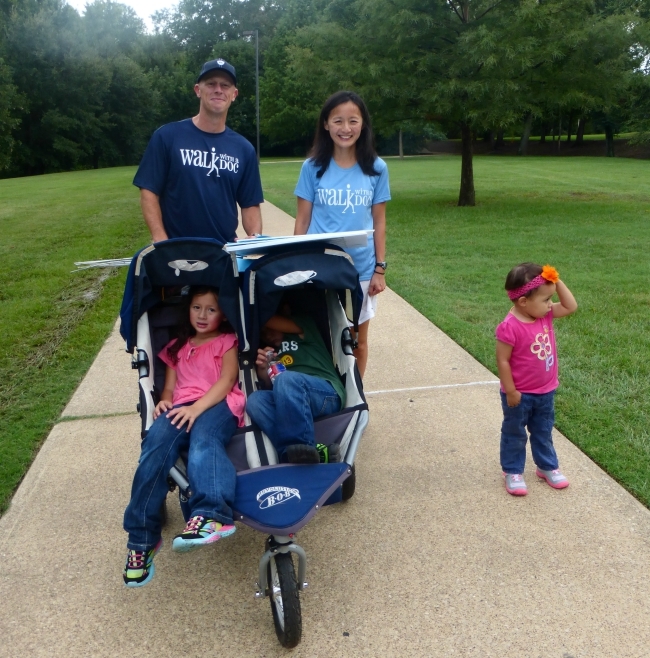 The Mitchell family at a 2014 Walk With A Doc outing. Photo courtesy of Mitchell family. Around the time Li-Yu began pushing a double stroller around Tyler, the city launched a campaign to battle obesity and poor health. Fit City Tyler aimed to get its 100,000 residents healthier “one bite, one step and one health-conscious decision at a time.” Support came from elected officials, companies, churches and citizens. Li-Yu thought something was missing from that list. “There were some physicians on the committee, but there were no physician-driven events,” she said. As a mother of two – and, then, three – plus running her career, Li-Yu was in no position to get involved. By 2014, she was. She told Fit City leaders about the weekly walking group with her patients and suggested doing something similar. 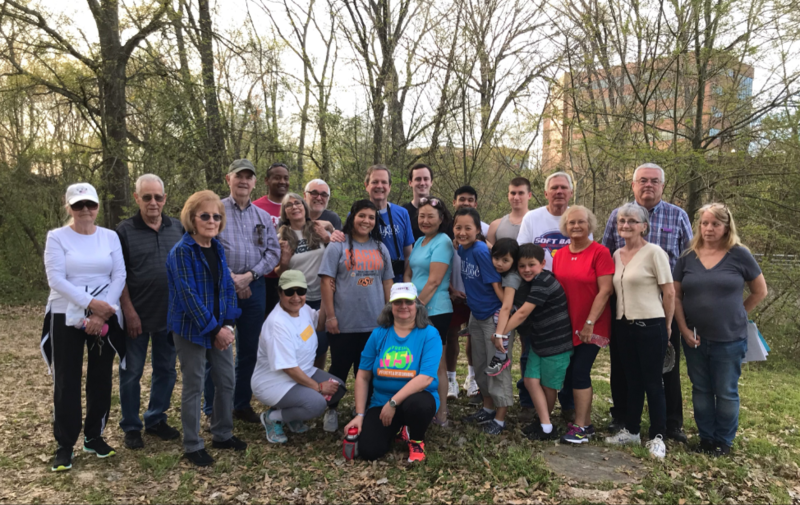 The idea was percolating when the executive director of the county’s medical society met David Sabgir, a cardiologist and founder of Walk With A Doc. Sabgir began the organization in Columbus, Ohio, in 2005, under circumstances similar to Li-Yu’s group. The two spoke by phone. Within months, she launched the Tyler chapter of Walk With A Doc. 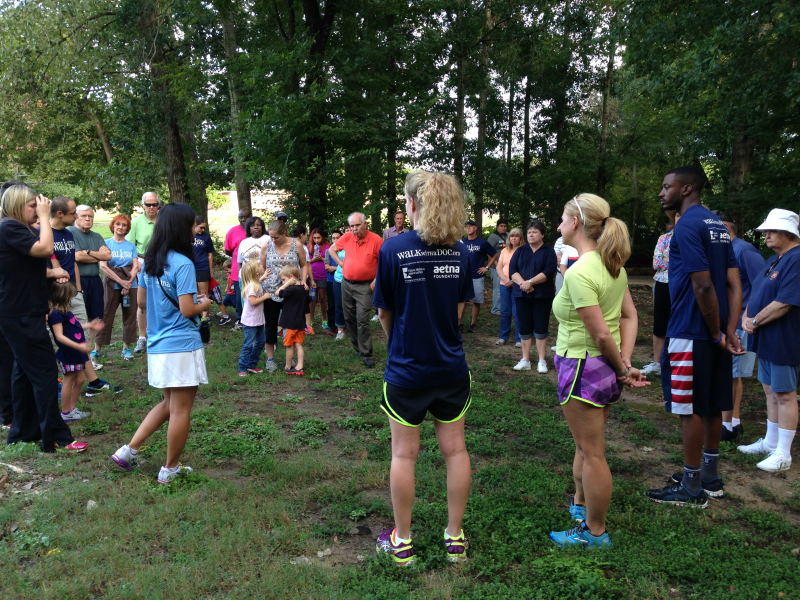 A key component of every Walk With A Doc event is a 10- to 15-minute health talk at the start. That alone prompted Li-Yu to round up more docs for the walk. Tapping into the county medical society, she found many volunteers. And they found the outings quite satisfying. Li-Yu addresses the crowd at a September 2014 Walk With A Doc event. Photo courtesy of Li-Yu Mitchell. Building on her newfound confidence as a community organizer, Li-Yu tapped local businesses to provide prizes for end-of-walk raffles. The first year, she landed about $8,000 in donated medical services, including stress tests and a colonoscopy. The dangling carrot of prizes has gone away, and outings have become seasonal. The spring series ends when it gets too hot and the fall series ends when it gets dark early. Events feature a 2-mile round trip. This spring’s 11-week season began March 21. Upcoming speakers include Li-Yu talking about “Exercise and Mental Health” and her husband, anesthesiologist Derek Mitchell, discussing “What to Expect the Day of Surgery,” among others. The debut event in 2014 drew about 100 people. Soon, it settled into an average attendance of about 40. Attendance is now about 20 people, but that’s not necessarily a bad thing. Photo courtesy of Li-Yu Mitchell. When Li-Yu’s twins were about 5, they began entering kid-friendly races at their parents’ running events. Now 10, they run their own 5Ks. Li-Yu’s 6-year-old daughter also has run 10 5Ks. “Seeing their sense of accomplishment crossing the finish line is so great,” Li-Yu said. After one particularly joyous finish, she shared the sentiment in a text to the PE coach at Mozelle Brown Elementary School. That led to a brainstorming session with the coach, principal and other parents. Soon, Li-Yu was planning an after-school run-walk club modeled after Walk With A Doc – meaning it starts with a health talk. The chat lasts only a few minutes. A recent one on the dangers of smoking – and vaping – included two sets of real pig lungs, a clean version and another scarred by tobacco. 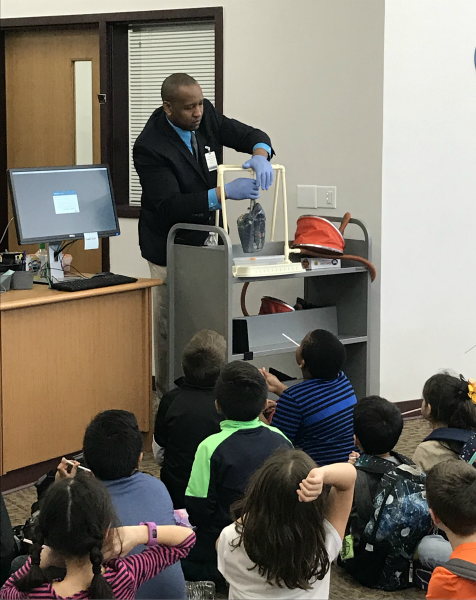 Terrence Ates of the Northeast Texas Public Health District demonstrates what a pig lung looks like after cigarette smoke has been pumped through it. Photo courtesy of Li-Yu Mitchell. Since debuting in January, a typical outing includes 70-80 kids, 5-10 parents and a handful of teachers. Everyone loops the school’s field, which is about one-fifth of a mile around, walking or running, taking their time or racing. They’ve got an hour to get in as many loops as possible. “The kids get fairly competitive,” she said. They’re especially competitive about the lap-counting chart that Li-Yu keeps. The thought of falling behind is why her kids pulled the plug on the family vacation in February. The Brown Elementary School Walk-Run Club in January. Photo courtesy of Li-Yu Mitchell. The school district has a word for Li-Yu’s program: Pilot. As in, it’s going so well that officials are considering expanding it to three other elementary schools. The benefits go beyond the obvious aspects of moving and learning from the health chats. Considering that nearly two-thirds of the students from Li-Yu’s school come from disadvantaged homes, this may be their only organized physical activity outside of school. “It’s also free daycare for an hour,” Li-Yu said. With so many plusses, perhaps the program could add up to something more substantial. Walk With A Doc, after all, has blossomed into roughly 500 chapters on every continent but Antarctica; a spinoff, Walk With A Future Doc, is at 26 medical schools. For now, Li-Yu remains focused on finishing this first school year. She’s tapped her Fit City Tyler connections for healthy snacks and is seeking more donations to reward the lap-leaders and frequent attendees. She’s already found an artist to decorate a logo for the name the kids chose: the Wildcat Walk-N-Run Warriors. Anyone who attends five times earns a T-shirt with that logo. Will some of those students become lifelong runners like Li-Yu? Will some of them become doctors like her?